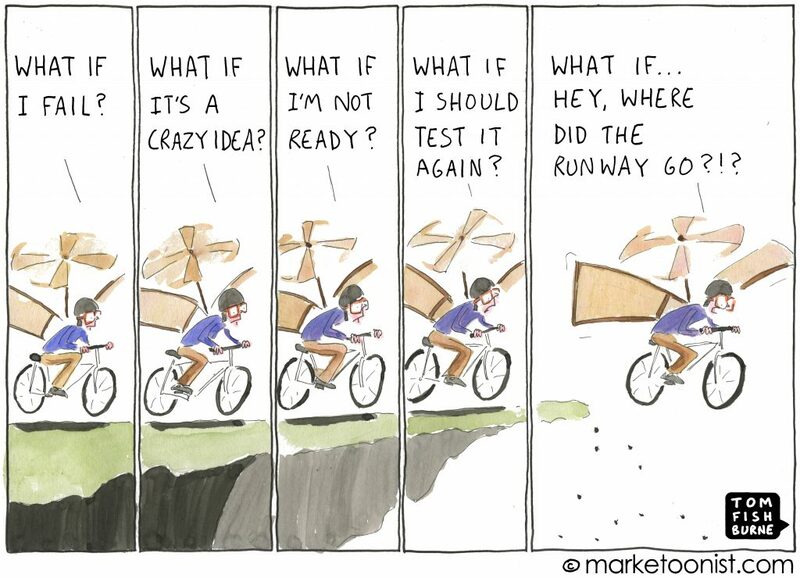 One of my favorite cartoons is from Tom Fishburne’s “Brand Camp” – it does a great job of illustrating our inner monologue as we consider a new venture. I tell my students that successful entrepreneurship is half about skill – what you know and do – and half about mindset – what you tell yourself along the way and how you overcome the inevitable obstacles (e.g., motivation, discipline, attitude). Think of the famous athlete who practices technical skills on the court, but also practices improving mindset off-the-court. To help with both skillsets, we have answered your top questions on business planning that we have received over the past few weeks. After you decide to pursue a venture, we recommend brainstorming all the possible options. We call this “ideation.” Then, you can narrow your focus into the most viable business. As I like to say – every idea is a good idea, but not every idea is a viable idea. We have a helpful step-by-step process, which works for both organizations and individuals, to help you home in on the best option. Business plans, which are, on average, 90 pages long, are judged on their content and readability. This is why the first and most important question you should ask yourself is: who is your audience and what do you need them to do? If it is an investor, you may want to start with a pitch, which is a visual flow of your idea and its business case. If it is for a company to get established, you may want a full business plan, which acts as an operating guide. You may also want to consider a quick, at-a-glance handout, such as a prospectus. All are worthy of exploration and can be mixed and matched based on need and audience. What process should I follow? Business planning can be overwhelming. To make things easier, we recommend breaking the process up and recruiting others to help. After you have decided on an idea and tested feasibility, start by building a team, creating an outline and developing a meaningful work plan. Identify a champion: Every project needs a lead. Find someone who can really commit to the project and who passes the “drive test,” (i.e., he or she will think about the venture all the time, including on their drives to/from work). Build a team: We consider business planning – much like strategic plans and grants – to be a team sport. We encourage our clients to convene a group of staff, board members and volunteer experts to serve on a core team and/or an advisory team. The core team should include staff and volunteers who are enthusiastic, committed to the idea and who have the time to commit to the process. The advisory team should include anyone who has less time to commit, but who can provide key insights and an objective perspective. We have devised a quick exercise to help with this brainstorming process. Create an outline: Once you have decided what you need out of your business plan, you should develop an outline. We have created a template with key questions to assist with this process. Then, divide the work up among your core team based on their interest and availability. We have created a worksheet to get each section considered, completed and reviewed. Develop a work plan: Deadlines drive plans forward and create momentum and energy. Develop a reasonable, yet ambitious work plan to drive the process forward and allow the team to agree on key deadlines. We have developed a sample work plan, but we encourage groups to use online project management tools, too. You do not have to do it alone. Outside of your network of staff and volunteers, there are many sources of help. SCORE and Executive Service Corp chapters can provide pro-bono or low-bono assistance. College and MBA interns can provide manpower and great research assistance. Even librarians at your local library can help research difficult questions using their access to proprietary databases. Be on the lookout for business plan competitions (a.k.a., pitch competitions) to test drive your plan and get objective feedback. We do not recommend hiring a consultant to write a business plan for you. Much like when you were a kid in school, when you copy off of someone else’s homework, you don’t learn anything. Business planning is less about the plan itself and more about the process that forces you to think, plan and decide about the business. However, do feel free to hire a consultant to assist with market research, business coaching or project management. The most successful business plan should tell a compelling story about your venture and serve as a roadmap for implementation. It should be balanced in its approach – optimistic, but also realistic about success. When the reader is done, the plan should have instilled confidence in you and your venture. The best business plans are living documents and are updated regularly as circumstances changes or lessons are learned. We welcome your input on the questions above and feel free to send us any additional questions you have about business planning.